When it came out, the first Evoland had a pretty novel idea for the time: it was an evolution of the RPG genre, taking us through various graphical eras in gaming from the Game Boy to the modern 3D era, and everything in between. It was an ambitious, but short affair, leaving those who played it wanting more. Evoland 2 expands on this idea significantly. It’s like going to a buffet and sampling many different foods, creating a diverse platter of game genres that are explored through its roughly 18 to 20-hour adventure. Many of Evoland 2‘s references are instantly recognizable. Others are a bit more subtle, but they’re there for all to see. Honestly, a good meta achievement here would be challenging the player to spot all the influences that make up the parts of Evoland 2‘s whole. But this isn’t quite like Guacamelee!, a game which shoved internet memes in your face and hoped that you got a cheap laugh out of it. Evoland 2‘s brand of humor is hit or miss; some of it made me chuckle, other bits of dialogue made me groan. 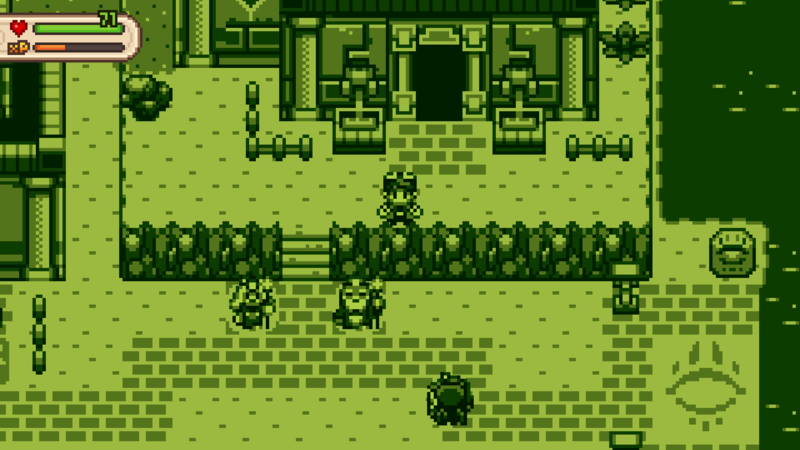 The story takes place in an original RPG world, where you wake up in a monochrome era, gaining additional abilities as you move forward and travel to different eras. As you travel to the future, the graphics become more advanced, changing from a Game Boy Advance color palette, to a more complex 32-bit PlayStation 2D style with more colors and sprite detail, and finally ending up in glorious 3D. I actually like the idea of the graphical style changing with the time period — it makes it easier to remember what time you need to be in to accomplish your objectives, so it never gets confusing. As you learn about the land’s history concerning a war between the Empire and Demonia, the home of the demons, you and your party set out to do everything in your power to prevent disaster. Naturally, in the vein of other time travel games like Chrono Trigger and Radiant Historia, setting history right is not nearly as simple as it seems. To accomplish your objectives, you’ll explore a variety of game genres as you proceed through the main story. One minute you could be playing a top-down action RPG swashbuckler that’s reminiscent of Ys, the next you could be brawling with your fists, Double Dragon-style, or flying a plane in a SHMUP sequence, or fighting a land war in a tactical strategy battle, culminating in a Guitar Hero-styled rhythm duel against an evil wizard. I felt that Evoland 2 did a good job of emulating the particular games it was pretending to be, but these parts sort of lack that special something that made the originals great. 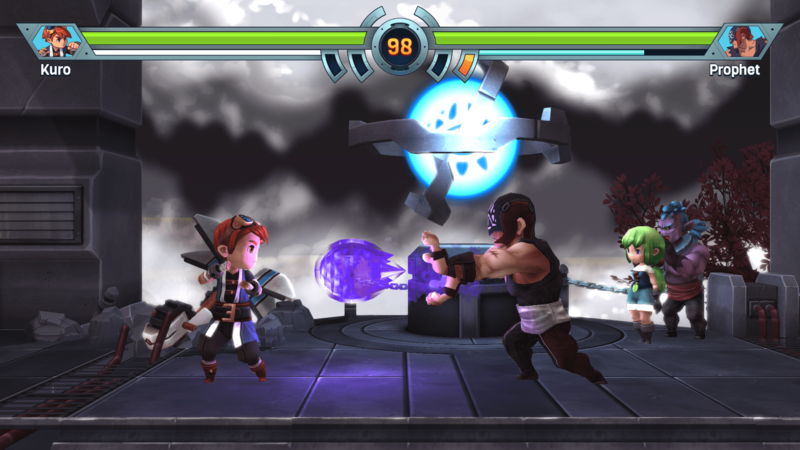 There are also occasional moments where Evoland 2 fell short, like the Street Fighter-esque boss battle with clunky controls, or a series of duels you need to fight by playing a game of Puzzle & Dragons where the computer has a clear advantage over you. Those were not much fun to deal with for me, but, even if you’re someone who’s not good at these sorts of games, if you’re playing on the normal difficulty like I was, you’ll get through eventually. The Street Fighter segment was far too short, and the controls felt off to me. The Double Dragon sequence was all right, but it was difficult to pull off special moves at times. What I didn’t really enjoy was the Puzzle & Dragons segment of the game. I just don’t care for match-three puzzle games, and having to do it ten times in a row to progress wasn’t my idea of a good time. The parts I most enjoyed were those that emulated the RPGs I grew up with. 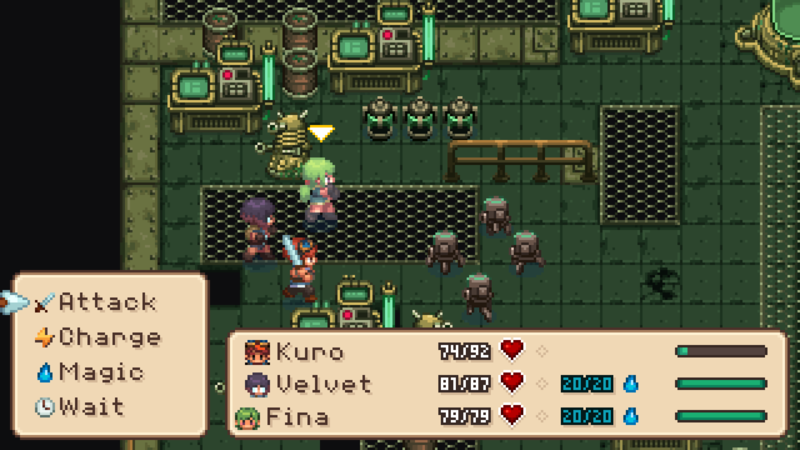 The above screenshot is part of a Chrono Trigger-like dungeon with some subtle Metroid and Pokémon references within, as well. 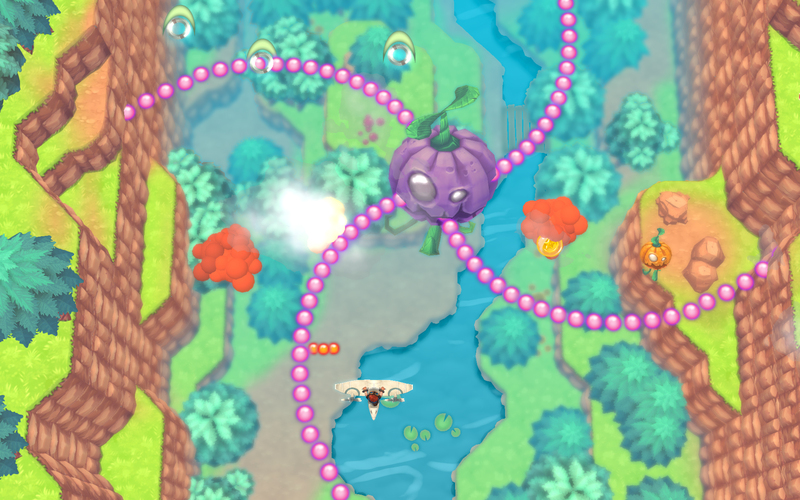 There are a couple of side diversions to be found in Evoland 2‘s world: once you can acquire a flying machine, you can play a SHMUP minigame at your leisure, and there’s also a collectible card game that works as sort of a hybrid between Triple Triad and Magic: The Gathering. There’s a battle coliseum that acts as a survival mode where you can do a beat ’em up against as many pirates as possible before you go down, and a locked house in Genova, the main city, where you can play the Guitar Hero sequence to your heart’s content. Stars are hidden throughout the times and locales, as well, and, if you’re an achievement hunter, you’ll definitely want to go for all of them. Evoland 2 has a pretty decent soundtrack, ranging from basic chiptunes that, like the graphics, grow more complex with the time period, culminating in real instruments when you reach the 3D future. The graphics themselves are pretty well done, and there is a nice variety of options on the main menu. But surprisingly lacking is an option for a windowed mode, which is odd for a PC game in 2015. You can force it by using Alt-Enter, but otherwise, there are no resolution options whatsoever. This is pretty disappointing, considering that, during the pixel graphic time periods, everything looks pretty stretched out on my screen at 1080p. What would be welcome here, I think, would be some kind of frame option to compensate for that. I think Evoland 2 has done a pretty splendid job as a meta game that glosses over many of the classic games and game types that make up an important part of gaming history. It’s an indie RPG love letter to the greats of the past, and serves as a reminder of the influences those games had on modern games today. It’s a little rough around the edges, but it’s a seriously solid adventure romp that’ll keep you occupied for around 20 hours. That’s a decent length right in line with its $20 asking price.